Lower leg fractures are acute, sudden onset fractures and normally caused by a direct impact, twisting or trauma. Stress fractures develop more gradually over time as a result of overuse. Both the tibia and fibula bones in the lower leg can suffer either type of fracture. The lower leg is made up of the tibia and fibula bones. The tibia is the larger, thicker bone on the inside of the leg. Its main function is weight bearing. The fibula bone is the smaller, thinner bone on the outside of the leg and its purpose is more as a point of attachment for muscles rather than to take the weight of the skeleton. Fractures from a traumatic impact are very serious injuries. The severity of fractures can vary, with some being easier to treat than other, more complicated breaks. ‘Closed’ fractures where the skin is not broken are more common and can be less problematic than ‘open’ fractures which break through the skin. The bone may also be broken in different ways. The fracture may be in a straight line, diagonal or even fracture in multiple places which can cause complications. With any break, there is the chance of suffering nerve, tissue, ligament and muscular damage. Fracture of the tibia is the most common long bone fracture injury and can take a long time to recover from. 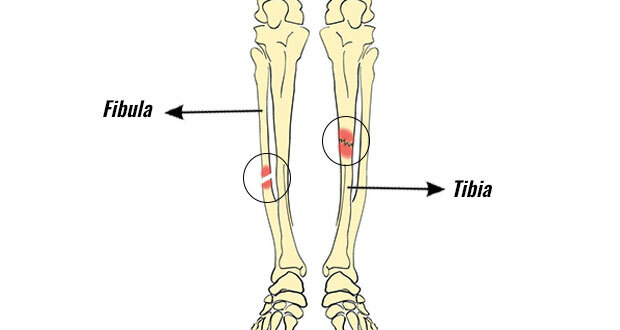 The tibia is the main weight-bearing bone in the lower leg and the break can happen anywhere along it. Tibia fractures can also affect the knee and ankle which causes further complications and requires more intensive treatment. The easiest fractures to heal are ones that occur in the middle of the bone and when the bone mostly stays in line, without much displacement. When the bones are displaced at the break and aren’t in line, the injury is more complex to treat and normally requires surgery. When the bone shatters and breaks in multiple places, it will need surgery and a longer time to recover than if it were a clean break. Read more on tibia fracture. Acute pain, rapid swelling, and tenderness around the break can indicate a fracture, and there will be difficulty when trying to put weight on the leg. In severe cases, a deformity may be visible. As the fibula is not the main weight-bearing bone in the lower leg, it is possible to continue activity even when it is fractured. 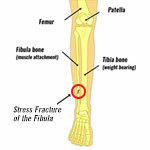 The fibula provides a surface for muscles to attach to, so a break may affect these. Fractures of the fibula can occur with a serious ankle sprain. Read more on fibula fracture. 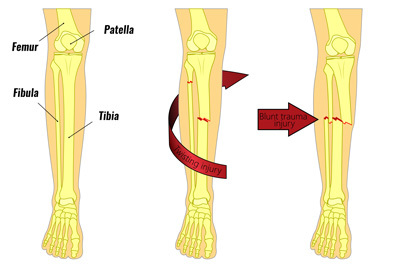 The tibial plateau is the upper surface of the tibia or shin bone. It is prone to becoming fractured in high-speed accidents such as those associated with skiing, horse riding, and certain water sports. Fractures of the tibial plateau are considered serious as this upper surface of the bone contains structures which are critical to the knee. Fractures of the tibial plateau are often associated with injuries to the anterior cruciate ligament, collateral ligaments (MCL or LCL), menisci and articular cartilage. This damage, although repairable, highly disposes the knee joint to the early onset of osteoarthritis, particularly in younger patients. Read more on tibial plateau fracture. Stress fractures are when there is a small, hairline fracture in the bone, but not a complete break. They are caused by overuse and repetitive impacts over a period of time, rather than a traumatic injury. Because of the high forces that go through the legs during sport, stress fractures in the leg are common in runners, dancers and in ball sports like basketball and netball. The risk of getting a stress fracture can when athletes increase their training load or change their training surface. As the tibia is the main weight-bearing bone, it is at a greater risk of stress fractures. Pain is normally in the lower third of the leg above the ankle and often gets worse after long periods of running or activity. Tenderness and swelling may also be present. Changes in running surface and doing more training may increase the chances of getting a stress fracture. When the muscles are tired, there is a greater chance of a stress fracture as the muscles are less able to take the weight, so the bones take more of the pressure. Read more on tibia stress fracture. This is less common than a tibia stress fracture as the fibula doesn’t carry the same amount of weight. The fibula is used for muscle attachment rather than weight-bearing so it is harder to get a stress fracture. The traction and twisting forces on the fibula from the attached muscles can cause a stress fracture over time. Overpronation (when the feet roll inwards) can also place more pressure on the peroneal muscles, which can cause a stress fracture. Pain which gets worse with exercise is the main symptom, and there may be local tenderness on the fibula bone. Rest will usually make the pain go away. Read more on fibula stress fracture.